A new study of flint axes suggests that the first farmers in southern Scandinavia were not Scandinavian hunter-gatherers; they were central European immigrants. The agricultural revolution, which started 6,000 years ago, represented a sharp break with a hunter-gatherer culture that had existed for as long as humanity itself. Various hypotheses have attempted to explain how Scandinavians learned to cultivate the land and where these skills originated. A new PhD study of flint axes and flint mines now suggests that Scandinavians were taught these skills by immigrants from the south, who settled in the region and started to cultivate the land. ”Some 6,000 years ago, new agricultural power centres emerged in southern Scandinavia. These were Scandinavia’s first farmers,” says Lasse Sørensen, a PhD student at the National Museum of Denmark. Sørensen recently presented the findings from his study at an international symposium on how agriculture made its way to the North, which forms part of the ‘Northern Worlds ’research project at the National Museum of Denmark. The great unanswered archaeological question regarding agriculture in southern Scandinavia (from northern Germany to just north of modern-day Stockholm) is, according to Sørensen, how it spread. Did it spread solely as internal knowledge among Scandinavian hunter-gatherers who converted one by one, or was it newly-arrived farmers from the south, who taught the hunter-gatherers the practices of agriculture? As early as 7,000 years ago, the central European population started cultivating the land and keeping livestock. The milder climate gave the pioneer farmers a greater margin of error in their attempts to learn the farming trade. In southern Scandinavia, there is also archaeological evidence of indirect contact between hunter-gatherers in Scandinavia and these new, more settled agrarian cultures to the south. These finds include numerous shoe-last axes (a specific type of amphibolite axe), which have found their way up to Scandinavia through various detours. However, although there appears to have been contact between the hunter-gatherers in the north and the farmers in the south, neither livestock, corn nor agricultural knowledge was exchanged between the two cultures in the 1,000-year period during which central Europeans started living like farmers and Scandinavians started taking up this practice. “If the shoe-last axes were brought to southern Scandinavia by farmers, there’s no doubt that these farmers would have cultivated the land,” he says. Around 6,000 years ago, however, a revolution occurred and a new axe saw the light of day in southern Scandinavia. As agriculture was gaining ground, the pointed-butted axe, which was specifically used for clearing forest land for agriculture, became increasingly common. 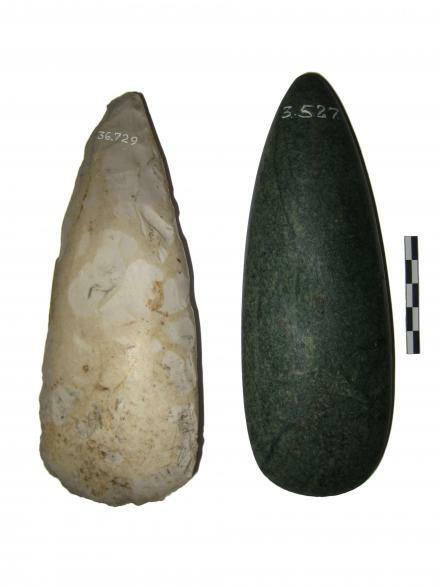 “The first time we see the pointed-butted flint axe is in the Michelsberg culture in northern France, southern Belgium and Holland. Originally the pointed-butted axes were made of jade, but during the late 5th millennium imitations of these axes were made in flint. A few centuries later, during the early 4th millennium, pointed-butted flint axes reached southern Scandinavia and the British Isles,” says Sørensen. The design of the pointed-butted axes is a good indicator that the first Scandinavian farmers were immigrants from the Michelsberg culture region. The flint for the axes was procured from flint mines. This type of flint mine is known from the Michelsberg culture, whereas in Scandinavia the flint was collected along the beaches. ”These flint mines are typical of the Michelsberg culture, but they also appear in southern Scandinavia 6,000 years ago synchronic with the introduction of farming. This indicates that there have been immigrants in Scandinavia, who did things in a different way,” says the researcher. In his study, Sørensen has collected information about finds of flint axes from throughout southern Scandinavia. Based on the concentration of the finds, he can see that agricultural power centres were scattered around in the early days of agriculture. He reckons that farmers living within these power centres have shared their expert knowledge with local hunter-gatherers, who learned from the new immigrants and started cultivating the land and keeping livestock themselves. “Agriculture spread out throughout southern Scandinavia from these power centres. In some flint mines we see signs of mass production, and flint axes from these mines are distributed over a large area. The Michelsberg culture was a key Neolithic culture in central Europe, dating back to approximately 4400-3500 BC. The culture stretched from Switzerland in the south to Belgium in the north. The culture takes its name from an important excavation site on Michelsberg hill in Germany, where archaeologists have found remains of wooden buildings and ceramics. Here they have also found bones from cows, pigs, sheep, goats and dogs.